The previous week I’d played a blinder. There had been no snow and no view, but I was on form, knocked ten minutes off my normal ascent time and didn’t have the usual urge to lean on the trig point and heave like a cat offloading a furball. Ah the joy of partially reclaimed fitness. The tickle in my sinuses on the way back down was a hint of what was to come. One week, two packs of paracetamol and three boxes of tissues later, the girls we all sequined up and off to see Strictly at the Hydro and I was hunting for an gentle day out to play. The lurgy wasn’t entirely gone, but with temperatures dropping and snow returning there’s no way I was going to stay at home, this might be all we get this year. 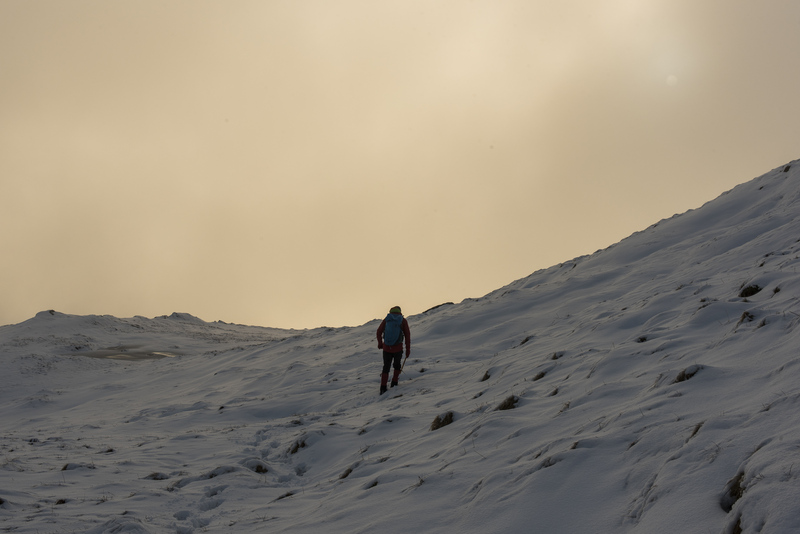 For some reason I associate the smaller Arrochar Alps with an easy short day out. It’s only when I’m on them that I remember that they regularly kick my arse. It’s a strange mental block, I swear and struggle on the way up, then once I’m off the hill I’ll immediately forget again. I was blissfully ignorant of this as I pulled the car to a stop at Butterbridge. The snow was melty (technical term), just an inch or so on top of wet grass which made for interesting developments in traction. 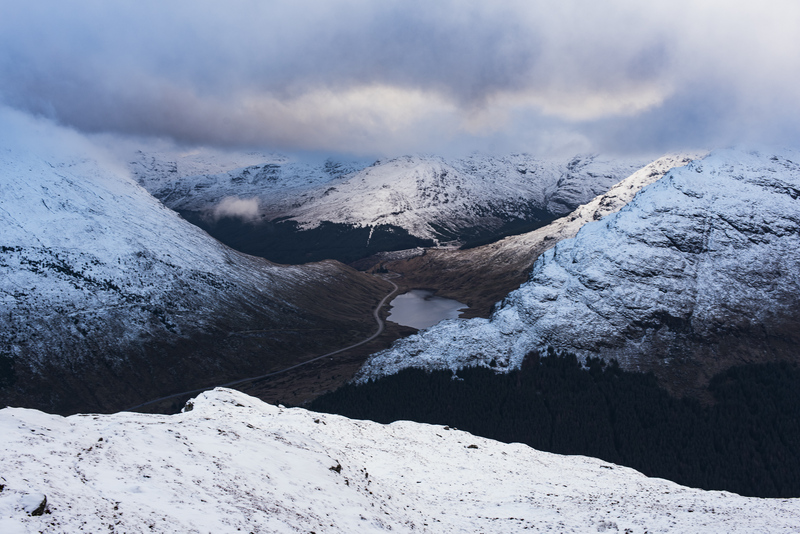 I branched up the slanting gully and up over the first bump that forms the skyline from the road, into the low cloud to find some deeper but equally wet snow. Progress was slow and it felt like someone had sneaked into the house overnight and replaced my lungs with a much smaller pair. There were hints of a landscape through occasional 3-second-long windows appearing in the mist. There was a chance of inversion and there was also a chance of seeing bugger all. When Central Wall loomed into view, it looked massive. 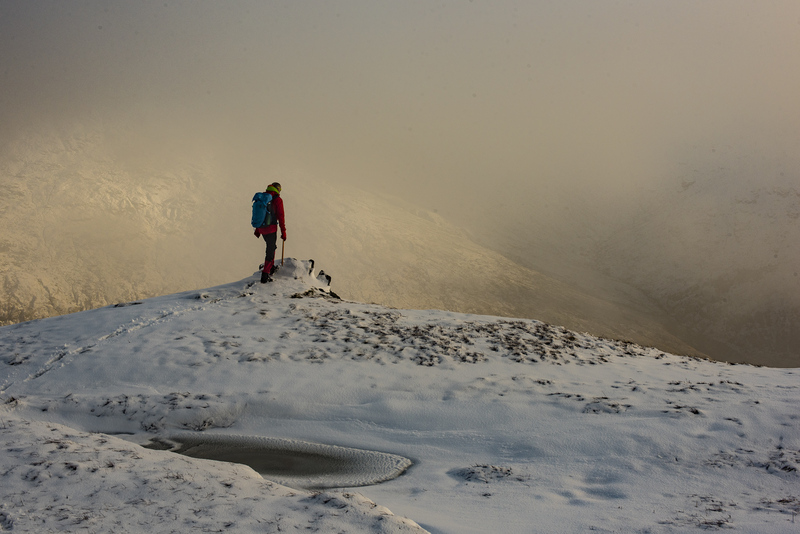 If you can see a crag coming it’s fine, but when it suddenly looms up out of the mist the surprise adds some scale. The otherworldly feel was amplified by the noise of traffic from the unseen road below being reflected from the rock. It sounded like I was about to be hit by a fish lorry at any moment. Slightly disconcerting. I traversed below the slabs and up the groove between it and Right Wall. 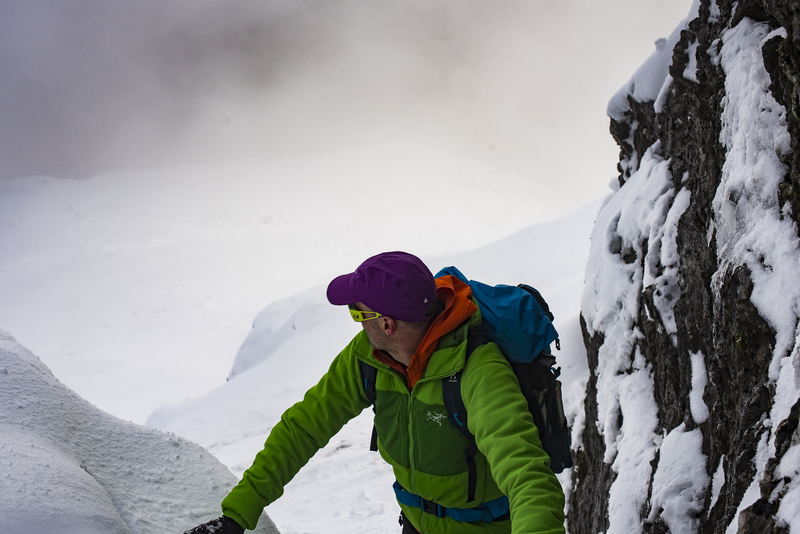 Some ice here, but it was drippy (technical term) I heaved and wheezed towards the summit buttress where the snow was deeper but utterly unconsolidated, as expected. It was steep. Why can’t I remember how steep these hills are? Much snottering and regular pausing ensued. 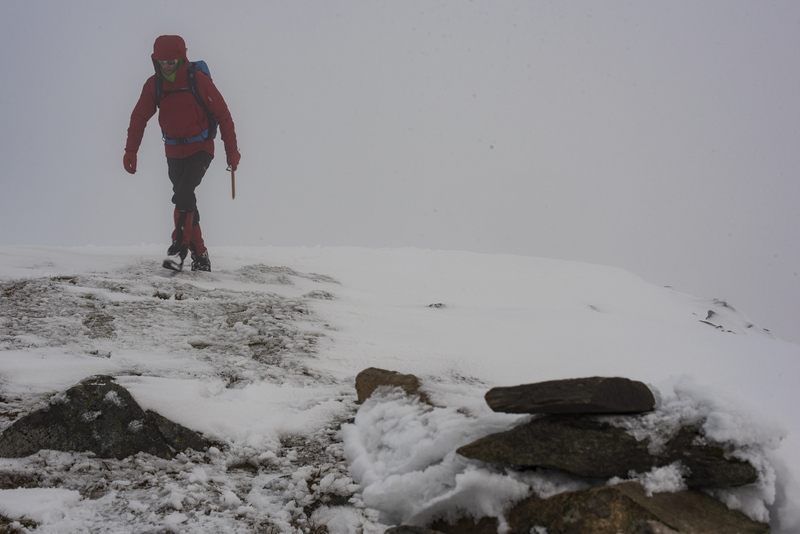 The last stretch up to the cairn was more wading than walking, so I pushed out to the left and picked up a narrow chimney to top out, five metres of snowy clambering goodness. That might be it for this year, we’ll see. Coffee and Christmas cake. If there is a better combo for a wee break on a snowy summit, I haven’t found it yet. 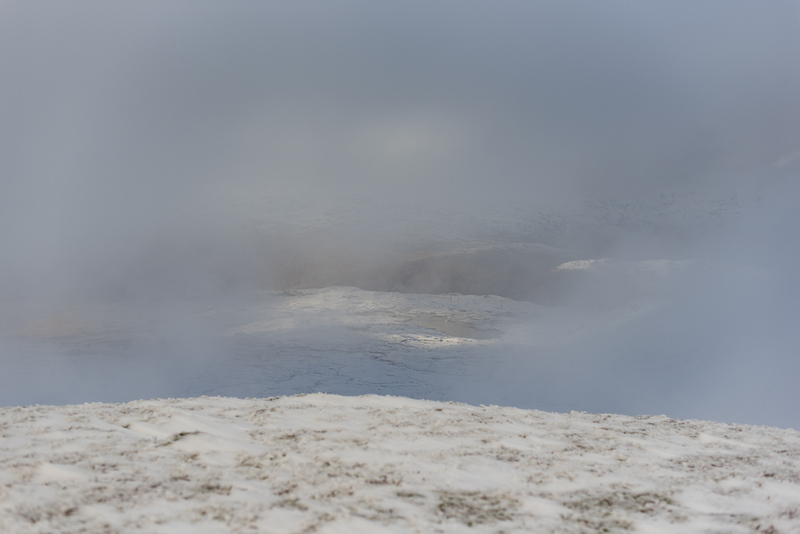 I sat and watched as the mist swirled and opened another wee window north. I knew it wasn’t worth getting the camera out of the bag, by the time I found it the window would have closed, so I sipped coffee and just watched it happen. A wee gift from the mountain gods for my toil. It was bloody toil too, how different from only the week before. Still, I was out on the hill and it’s the days where I choose to keep my arse in a seat that worry me more. Better a hard day on the hill than a easy day in the office. Reversing the route of ascent would have been tedious and downright dangerous in places, so I headed off along the ridge to drop down the gully below Creag Bhrosgan. By the time I slipped and squelched down to the road, it was getting dark and I was done in both senses of the word. If you’re looking for me I’ll be on the stair climber at the gym. Thank you both, I write these things mainly because they'll fade from my memory without some reference point, it's good to know that someone is enjoying it too.